How can i integrate free Helpdesk system UVdesk with Magento2 ? Dear Clients, Ticket Reply will delay due to the Holiday for Good Friday (Long Weekend) we will resume our work from Monday 22nd April 2019. Happy Weekend! 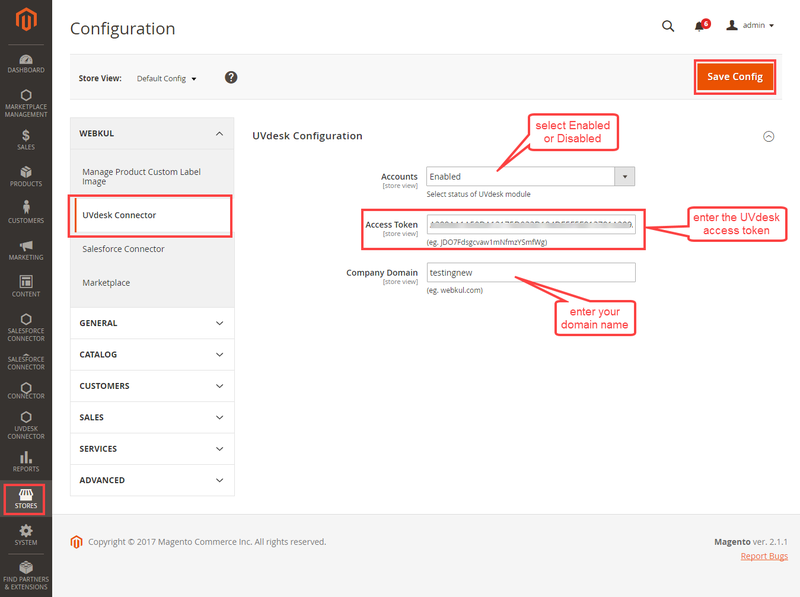 By the help of UVdesk Free Helpdesk for Magento2 your registered user can create a support ticket from the front-end and the admin and its assigned agents can manage all the tickets either from the Magento back-end or from the UVdesk Dashboard. All the information about the tickets is synced between Magento store and UVdesk Dashboard. The tickets are categorized using various labels and statuses. For the integration, the admin needs to have the UVdesk Credential by registering in the UVdesk and then you have to get "API Access Tokens". For this module to work, the admin has to enter the domain name with which they have registered in the UVdesk, Access Token and enable the module. After that, all the information about the tickets is automatically synchronized between your Magento store and your UVdesk Dashboard. Every ticket has a unique ticket number assigned to it which helps in managing them. Information such as ticket status, ticket priority, ticket labels, the number of replies etc can also be seen by the admin and agents. UVdesk - How to create a Mailbox? UVdesk - How to import data from osTicket to UVdesk? UVdesk - How to configure Gmail with Mailbox? UVdesk - How to add support agents? UVdesk - How to create a ticket in UVdesk from the support panel? Unable to find an answer? Looking for anything specific article which resides in general queries? Just browse the various relevant folders and categories and then you will find the desired article. © Copyright 2018 UVdesk, All rights reserved. Are you sure? You want to perform this action. Some of our site pages utilize cookies and other tracking technologies. A cookie is a small text file that may be used, for example, to collect information about site activity. Some cookies and other technologies may serve to recall personal information previously indicated by a site user. You may block cookies, or delete existing cookies, by adjusting the appropriate setting on your browser. Please consult the HELP menu of your browser to learn how to do this. If you block or delete cookies you may find the usefulness of our site to be impaired.